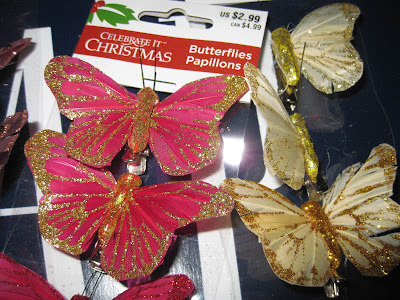 Kalifornia Love: More Butterflies for my Hair (Pack of 4 for $1.49 @ Michaels) & Upcoming Giveaway Thoughts? 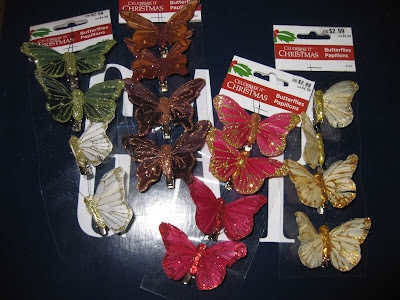 More Butterflies for my Hair (Pack of 4 for $1.49 @ Michaels) & Upcoming Giveaway Thoughts? I think you all know about my butterfly obsession by now since my last post where I showed you the $1 butterfly clips from H&M. Well, I wanted to show you more. 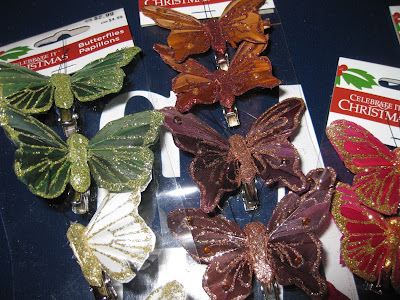 I picked up these packs of 4 today for only $1.49 each (they were on sale from $2.99) at Michaels craft store. Unlike the H&M clips, these are made of feathers, have lots of glitter, are smaller, and are very fragile. I had to mix and match the clips from other sets because every set had at least 2 or more broken butterflies. I wanted to remind everyone that my Birthday Giveaway will be ending very soon (in 5 days to be exact.) Please enter before it ends!! I also wanted to let you know that I am no sure if I will be able to sort out the winner before Christmas as I'll be very busy -it'll probably be a few days or a week or so after Christmas. hehe i used to be obsessed w/ butterflies !!! =DD the *hairclips* are so cute!! The idea for valentines day giveaway sounds good to me! 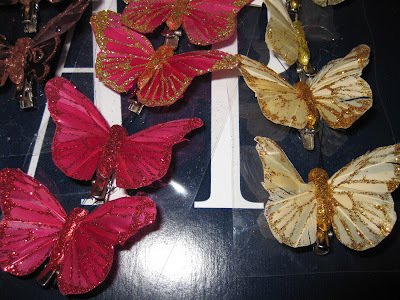 and those butterflies are really glittery and pretty. I got one of those at the dollar store last year and it's still clipped to my lamp at home! @ Lulu T.. Thanks. I'm definitely going to do the giveaway. @ Pop Champagne.. I don't have a lamp anymore but I'd so clip them to my lamp shade if I did! I <3 butterflies. Yay.. your birthday's coming up! Any plans for the big day yet? I actually bought some JUST for that purpose. =) And thank you for the "Spring giveaway" idea -I love it!